How Can I Get My Electric Wheelchair Repaired? If you use your motorized wheelchair every day and put a lot of miles on it, eventually, repairs may be needed. Whether it’s a simple comfort adjustment or something more complicated, your provider can help! Regular service checks are vital to keeping your power wheelchair running smoothly. If you have a basic question or concern about your motorized wheelchair that may not require a provider visit, visit our Frequently Asked Questions page first! 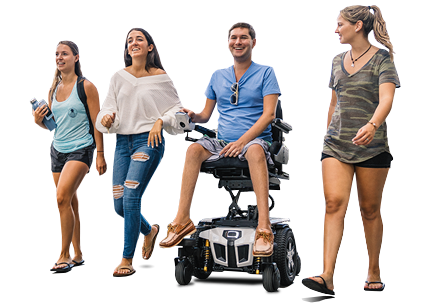 We provide answers to some of the most commonly asked questions about Quantum® electric wheelchairs. Quantum® power wheelchairs must be serviced by an authorized Quantum provider. Our providers are trained to perform diagnostic testing and repairs. Give your provider a call and schedule an appointment if you need service for your power wheelchair. We do not recommend consumers perform their own wheelchair repairs. This is for safety reasons. If you are unsure who your provider is, contact our Consumer Call Center. Our team of representatives is available Monday through Friday, 8:30 a.m. to 5 p.m., to assist you. Call 1-833-QiLevel (745-3835) or email at info@pridemobility.com. Your Quantum motorized wheelchair is considered Durable Medical Equipment (DME), if it is found to be medically necessary by Medicare and a physician. If you are a Medicare Part B beneficiary and Medicare Part B covered the cost of your electric wheelchair, Medicare Part B may also cover power wheelchair repairs. You can visit medicare.gov or call 1-800-MEDICARE (1-800-633-4227) for further details. If you have private insurance, you can contact your insurer to find out if they cover electric wheelchair repairs. Call the number listed on your insurance card and speak to a representative. If your insurance doesn’t cover motorized wheelchair repairs and you need help paying for the repairs, there are options available. Many Quantum providers accept credit cards, cash or money orders for their services. They may also offer financing options. Over hundreds of Quantum providers participate with CareCredit, a credit card that allows you to pay for medical equipment and services over time. The payment plan is based on your budget. There are also special promotional financing options available upon credit approval. Contact your provider today to find out how you can fill out an application or visit carecredit.com for more information.